Quest Potts Point Hotel & Serviced Apartments offer boutique hotel accommodation and studio apartments in a renovated remarkable art deco building in the heart of beautiful Potts Point, 5 mins from the Sydney CBD.Quest Potts Point Hotel & Serviced Apartments are conveniently located on the doorstep of Sydney's city centre, near Kings Cross, the city's entertainment district.This boutique Sydney Hotel & Serviced Studio Apartments are a contemporary home away from home, featuring earthy hues, bold patterns and subdued lighting which create a glowing atmosphere of warmth and luxury throughout. The Quest Potts Point is close to everything that Sydney has to offer and features numerous guests facilities including lounge bar, direct internet access, disabled facilities, faxing facilities, guest laundry, lift, restaurant, tour desk, baby cots available and daily housekeeping. Quest Potts Point Serviced Apartments Sydney is the perfect central location for sightseeing around Kings Cross and other parts of Sydney including the Sydney Opera House, Botanical Gardens, Darling Harbour, Bondi Beach and the Sydney Harbour Bridge. 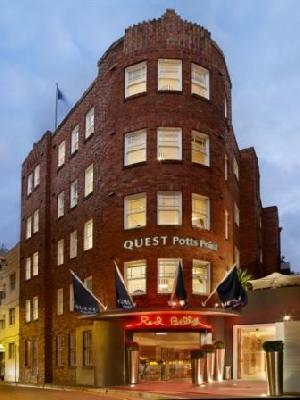 Quest Potts Point Sydney Hotel & Serviced Apartments offers quality accommodation in a fantastic Sydney location to suit the discerning corporate and leisure traveller alike. Nearby Attractions : Situated in the heart of Potts Point and centrally located for exploring the best of Sydney, Quest Potts Point is surrounded by cafes, restaurants and shops and is minutes from Sydney CBD. On the doorstep of Sydney's city centre with the famed Kings Cross and sophisticated Woolloomooloo Wharf within easy reach, Quest Potts Point is only moments away from Sydney CBD, Sydney Harbour Bridge, Sydney Opera House and Darling Harbour. Deluxe Studio Apt : Sleeps up to 3 guests on 1 Queen Bed + Rollaway Bed Extra. Executive Queen Studio Apartment : Sleeps up to 3 guests on 1 Queen Bed + Rollaway Bed Extra. Executive Twin Studio Apartment : Sleeps up to 5 guests on 2 Queen Beds + Rollaway Bed Extra. Superior Studio Apartment : Sleeps up to 3 guests on 1 Queen Bed + Rollaway Bed Extra.